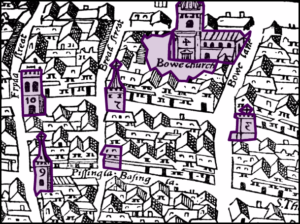 This morning as I was preparing a biographical preface for Obadiah Sedgwick, I was reading about one of the churches he served in, and in doing some research on the internet, found this wonderful interactive map of the city of London, circa 1561. Called the Agas Map, it is an exquisitely detailed drawing which has been overlaid with information that helps the user quickly pinpoint major landmarks (including churches) in the city. Very helpful and worth bookmarking. You can find it here or by clicking the picture above. Very interesting, me and my son love maps, we’ll enjoy looking through this.